When you travel a lot, you don’t necessarily have the time to safely prepare a great meal. Fortunately, there is now a method that will allow you to cook better and safer than you have when utilizing a gas or electric cooking surface, and you’ll even be able to take it with you. Induction cooking was conceptualized more than a century ago but has only recently come into the public’s awareness. This cooking technology uses electromagnetic stimulation to excite the structure of your pot and therefore generate heat. Without the pot, the surface cannot actually heat up, so a portable induction cooker is one of the safest electronic appliances to travel with. You can literally keep it in any bag and there will be no danger of inadvertent heating. For your education, we’ve pulled together a list of some of the best models on the market today, so take a look and learn a little more about this new style of food preparation. 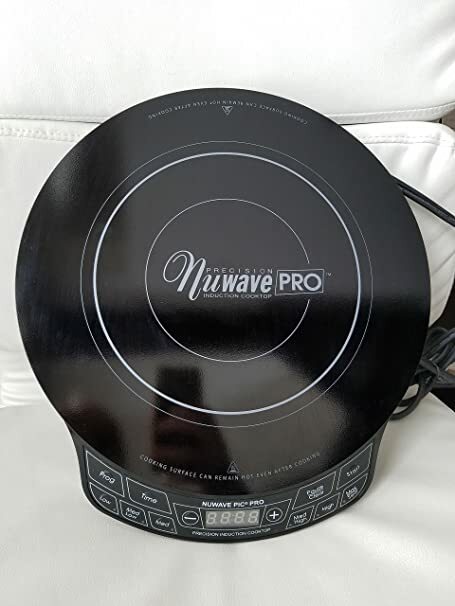 Our Gold Pick, NuWave’s Precision Induction Cooktop (PIC), is one of the first induction cooktops that consumers became aware of in recent times. It utilizes this great heating technology to provide lots of features and more than enough space for extensive food preparation. As the latest version of the now-iconic series of devices, this induction cooktop has a lot going for it. The first thing you’ll notice about this device is the fact that it has a large cooking area. The entire unit measure in at 15.2 inches from front to back, 14.3 inches from side to side, and 6.4 inches in total height. The cooking surface actually measures in at a full foot, so basically, you should be able to fit any inductive cookware onto its surface and expect a nice even heating along the base of the pot or pan. This really is the perfect induction surface to cook food in a large skillet or pot. A unique feature of this type of cooktop is the ability to store it safely away without worrying about malfunctioning heating elements or inadvertent short circuits that can cause a fire. Induction cooktops are very safe to travel with, and to that end NuWave has included a woven nylon carrying case with this cooktop. This makes the relatively light device (it is about 7.5 pounds in total) easier to carry from place to place without much fuss. Because of its unique nature, you can store this device in just about any area that it’d fit. As long as the area you store it in is dry, you won’t really have to worry about the device at all between uses. Also, deploying the device for a little cooking couldn’t be easier, simply plug it in, power it up, and place an induction friendly stainless steel or cast iron pot or pan on the surface and begin cooking. When it comes to functionality, this induction cooktop features some cool features that make it worthy of the Gold Pick ranking. First, let’s get into its heating capabilities. On the main console of the device, you’ll find six specific temperature settings. The lowest temperature is sensibly represented with a ‘Low’ button that will heat the cookware up to a temperature of 100 degrees Fahrenheit. The second heat setting is ‘Med Low’ which will raise the temperature to about 175 degrees Fahrenheit. Following that, ‘Med’ represents 275 degrees Fahrenheit, ‘Med High’ is 375 degrees Fahrenheit, ‘High’ will set your cookware to 425 degrees Fahrenheit, and the final ‘Max/Sear’ setting will heat your cookware to the highest possible temperature of 575 degrees Fahrenheit. 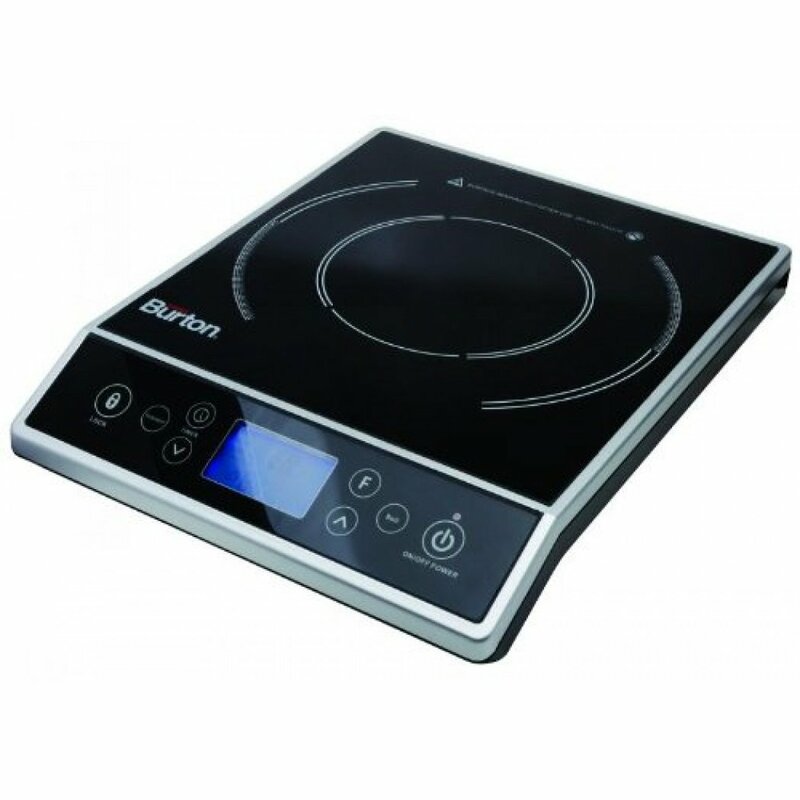 This induction cooktop also has a lot of power so that your food will cook faster and more evenly. This model utilizes a full 1800 watts of power and each mode will utilize a different wattage, for example ‘Low’ will use about 200 watts of power and ‘Max/Sear will utilize 1800 watts. Another great feature of this induction cooktop is its ten second delay function. This function will allow you to remove your cookware from the cooking surface without having the induction process reset for a full ten seconds. This will afford you time to add ingredients, dish up food, and switch cookware without having to restart. Our Silver Pick induction cooktop, which comes to us from appliance company Secura, is a great option for those looking to supplement their conventional stovetops with a new, more efficient and portable induction model. Its shape is much more kitchen-friendly in design than our Gold Pick, and since it is square and relatively minimalist, it would fit perfectly as with any kitchen décor. Not only is this induction cooktop rectangular in shape, but it also has a downward sloping panel that houses all of the cooktop’s settings. Insofar as measurements, this device is 16.4 inches from the front to the back, 12.8 inches when measured from side to side, and a full 3.8 inches from its base to the top of the cooking area. Prior versions of this device featured a completely flat form factor, but this caused problems with hot cookware damaging the controls. Now with the downward sloping control area, you’ll be able to avoid this heat damage entirely. Just like the NuWave model, you can store this device in any area that’s dry and can accommodate the devices size. This is also a great travel model despite its angled sides; it only weighs about seven pounds in total, and it’s perfect to pack away in a suitcase or travel bag. As a matter of fact, since this device is so easy to store, travel with, and hook up, it’s perfect for students who want to bring some home cooking into their dorm life. All you need is a 120v outlet, and you should be golden; especially considering that Secura also includes a six foot power cord with this purchase. When it comes to function, the device actually employs a 15 level heating system that will give you a wide variety of heating choices that range from simply keeping a food or liquid item warm, to fully heating an item at its max temperature of 460 degrees Fahrenheit. Like our Gold Pick, these heating levels run the same wattage range; 200 watts or so for the coolest setting and 1800 for the hottest. Another great, unique feature of this cooktop is its internal fan. Once the induction process begins, the fan starts as well. This fan will continue to keep the components of the cooktop cool until well after the cooking process is complete, which will help dispel the hot air that can get trapped inside the device. Our Bronze Pick comes to us from the appliance experts at Max Burton. Max Burton has an extensive line of home electronics and kitchen appliances that are designed to make life easier for the average consumer. Their induction hob is a great choice for those looking for a way to supplement their kitchen’s more traditional cooking surfaces. From an aesthetic perspective, this induction cooktop has a lot of physical similarities to the Secure model that serves as out Silver Pick. It has a square-shaped cooking surface and a downward sloping main control console. When it comes to physical dimensions, this is the smallest device that we have covered thus far. This induction cooktop is 13.5 inches from front to back, 12.5 inches from side to side, and 2.6 inches from top to bottom. Its smaller size makes it very easy to carry with you from place to place and only requires a 120v power outlet to function. This ease of use and portability makes this an excellent device for anyone who needs on-the-go cooking; it even has a 180 minute timer for dishes that require it. The heating range of this hob utilizes a 15 level heat setting that will allow you to adjust the output between 100 and 450 degrees Fahrenheit. To select the different heating levels, simply utilize the up and down arrows; each click will adjust the temperature in 25 degree increments. While not boasting the hottest output, the low 100 degree base is a great feature for those looking to keep beverages and dishes warm enough to serve comfortably. Another great feature is the one-touch simmer and boil controls that Max Burton has included with this hob. Induction hobs allow you to boil water very quickly, for this model you can bring one quart to a rolling boil in about three minutes, so having a dedicated button to bring your liquids to a boil makes this a very simple and easy option for when you want to start the process and move on to your next task. The simmer button gives you a similar level of ease as it will allow you to keep food at a servable temperature indefinitely, without the need to interact with the temperature controls at all. Simply put, induction hobs are more expensive to buy than other forms of portable cooktops. Fortunately, these also tend to save users a bit of money when it comes to energy bills as the devices are notoriously efficient. Still, there are certainly options for those users who are ballin’ on a budget. Inducto, the manufacturer of our ballin’ pick has managed to create a portable hob that is compact and portable, has some great features, and still manages to come in a price range that falls under $50. This is a completely flat cooking unit, it doesn’t possess the sloped console of the silver and bronze picks, so you’ll need to be careful not to inadvertently damage the screen and buttons when removing a hot piece of cookware from the induction surface. Outside of this concern, the device is very easy to use, you can store it anywhere as it is a relatively small induction cooktop; it’s only 17.2 inches from front to back, 13.5 inches in width, and 3.9 inches in overall height. This device has a maximum power output of 1500 watts, making it the lowest wattage device on our list, but you do have a great range of heating options; this device has a ‘Low’ setting that starts at 100 degrees Fahrenheit and a Sear setting that climbs all the way to 560 degrees Fahrenheit. Like our Gold Pick, there are a total of six temperature settings, which will give you more than enough options in food preparation. The hob features some safety features like auto shut off, an alarm when the cooking surface reaches a temperature that is too high, and a fan system that cools the surface quickly when there is no pan on the surface. • Safety Sensor –This is a very valuable feature. This sensor monitors the weight of the pan and judges if an empty pan has been left on the induction cooktop. When this happens, the device will automatically adjust the power output, so that there will be little damage to your cookware or to the device itself. This is the perfect protection for those situations where you may have forgotten to disengage the device after cooking. • Auto Switch Off – This is a fairly common and useful feature found in many induction cooktops. In a situation where the built-in sensors detect overheating, the cooktop will automatically turn the heating element down or off. This feature will protect against induction cookware overheating or even just an induction hotplate. • Pan Detection – Pan detection is a safety feature that’s built into many induction cooktops. When there is no pan, the heating process ceases. Also, when you remove the pan, many of these types of devices will display an indicator light, so you know that the surface is no longer inducing. • Child Lock – While these types of cooking surfaces produce much less ambient heat than those that use electricity or gas to heat your food, there is still a degree of danger resulting from the pot itself heating to high temperatures. This reduced danger is why some models of induction cookers have a built in child lock that will prevent little ones from accidentally turning on the induction process and inadvertently heating the cookware. • Boil Over Detector – Just like in more traditional styles of heating, induction cooking surfaces can generate enough heat in a piece of cookware to cause internal liquids to boil over dangerously. 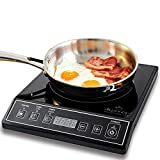 As a matter of fact, there is added danger in this situation because the liquids can actually get into your portable induction cooktop and cause damage to vital components. Fortunately, some induction cooktops have boil over detection that will sound an alarm when a spillover occurs. • Auto Heat Up – Some induction cooktops have a setting that will automatically heat the cooking surface to a high temperature level when you place your induction cookware or an induction hotplate onto the cooking surface. As your food reaches an optimal temperature, the cook surface will automatically normalize to a lower temperature. This is sometimes referred to as a booster. • Warmer – This is a setting that some induction cookers have that will allow food to simmer or be kept warm. This is handy for when you want to potentially get seconds. Some induction cooktops will actually simply utilize residual heat to keep the food warm; saving the excess energy of extended heat modulation. • Heat Light – This can also be considered a safety feature. Many standard electric stoves have this as well. Basically, if there is residual heat on the cook surface then a light will shine to indicate this. When looking for a new device, be sure that the heat light is bright and easy to notice. • Digital Readouts – Digital readouts are very useful with devices of this type. They will tell you the exact temperature of the food inside the cookware, and since there is such even heating when you heat food through induction, it can be assumed that most digital readouts are providing you very accurate information. • Timer – This is the perfect tool for nearly any kind of cooking, but is very useful for induction cooking as well. A timer is typically folded into the digital readouts and can either tell you when a set time has elapsed or automatically turn off the heating process when a certain time has been exceeded. This extra feature will help free up time for you to tackle another aspect of the food preparation. 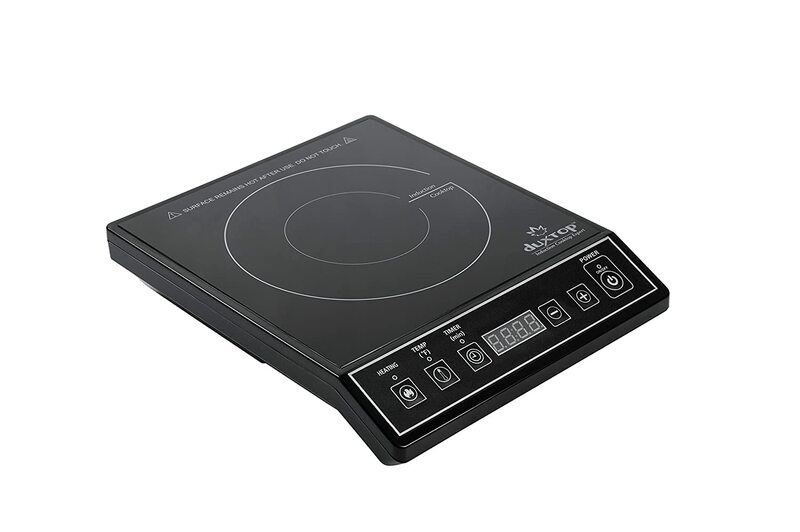 • No Contact No Heat – Without direct contact, the magnetic elements inside your induction cooktop cannot generate heat. This makes these devices very safe when compared with gas or electric range tops since these both use a dangerous source of direct heat to prepare food. It’s an amazing experience to be able to touch a cook surface and then place a piece of cookware on it a second later and watch water start to boil. • Precise, Even Temperature – Since induction cooktops heat the bottom of the pan evenly using electromagnetic manipulation, the whole metal base gets heated providing an even temperature throughout your dish. Just consider how either the grills on an electric stove or the flame on a gas stove only heats portions of a standard pot, this results in uneven heating that you’ll consistently have to monitor. • Smooth Flat Surface – Simply put, with so little angles and edges, it’s super-easy to clean an induction cooktop. Typically, you won’t be doing much heavy cleaning, just use a cloth and wipe away stains. Also, since it’s so nondescript, induction cook surfaces, even portable ones, look great in a minimalist kitchen. • Less Ambient Heat – Many professional chefs will tell you that they’ve lost yards of arm hair to finicky gas stoves. This is because electric and gas stoves use ambient heat to heat the food in your pot. Since the only heat generated is located at the base of your pot, there isn’t a whole lot of ambient heat. The result is a cooler kitchen and less singed chefs. This is not to say that there aren’t disadvantages to owning one of these types of portable induction cooktops. The chief disadvantage is how limited you’ll be in your type of cookware. Since you need metal for induction, you can forget about using stoneware pots and pans. Also, since the cook surface is usually coated in glass, it’s actually very easy to chip if you are shaking a frying pan on the surface too vigorously. Finally, this type of cookware; even portable ones like the ones we have reviewed in the write up, are more expensive than their gas and electric kin. This is mostly because the technology is relatively new. Induction cooking is the wave of the culinary future. Its inherent safety, efficiency, and ease of operation makes it friendly to a myriad of lifestyles and living situations. We hope that you have found our list of induction hobs helpful; they all are great entry points into the world of induction cooking and are all designed to last you for years. Each is easy to store, travel with, and use, but if these don’t suit you for some reason, you can always check use our pre-purchase considerations to help find a model that is more your cup of tea.